So these are a 1/3 demi lash and you'll get 2 pair in a pack. They have a fairly thick black band so wearing eyeliner is going to be necessary to help them blend. If you see these in store and decide to give them a go, make your selection carefully as I noticed some of the bands are a little longer than they need to be, try to get a pair with just small band ends like the ones pictured below. I find these little bits at the end can be difficult to stick down, when they are long they can rub on parts of your eye when you blink and if anyone is close enough they can be noticeable, especially to makeup lovers who have a keen eye. I find the shorter ends are less conspicuous. Removing them from the tray is probably the most difficult this you will experience with these lashes, they are stuck on there real good! Once you get them out of the tray the rest is smooth sailing. 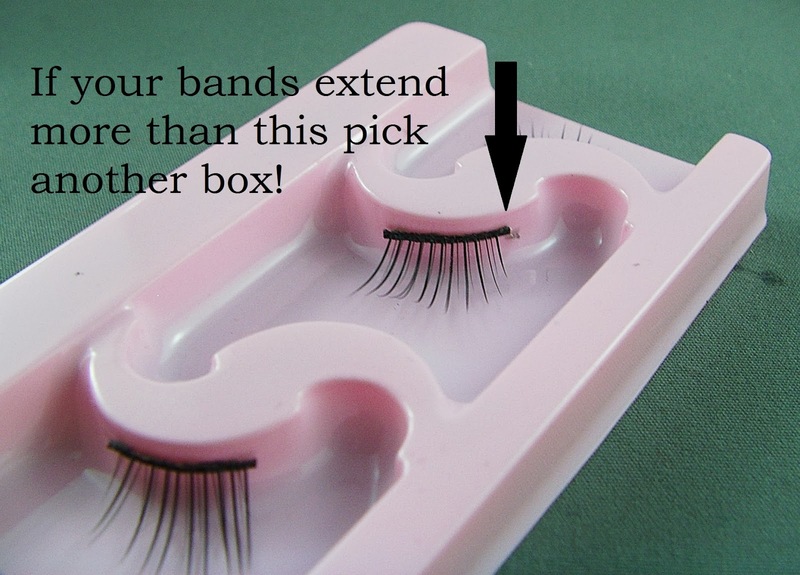 Don't pull by the lashes, try to peel them off by the band and if they seem a bit out of shape when you finally get them out just bend them a little to soften the band and get that curve back. They are reusable and removal on subsequent use will be much easier. I find them easily applied with a pair of tweezers, obviously your glue is going to depend on how well these wear but use some Duo and you'll never have a problem. They look quite natural and aren't too long so they blend really well while adding a really pretty dense lash effect to the outer section of your lash line. As you can see from the picture above it's really important to make sure the ends are pressed in firmly when you apply them. Also I like to run over them with a black liner once they are set. There they are in all their cheap glory! They offer a little extra lash without looking majorly fake and when you tone down your eyes you can do stuff like this with your lips..
Have you tried Daiso Lashes before?? 2 comments on "Blogmas: Daiso - Angel's Eye Demi Lashes." Very pretty and natural way of applying lashes ^_^ I haven't tried Daiso's lashes, but I bought a fountain pen the other day and i'm keen to try their brush cleaner! I have searched high and low for that brush cleanser, if I ever see it in my local store I'm going to buy multiple bottles! They also sometimes stock a caramel corn/pop corn type stuff that I love. I think I'll pop in to the store tomorrow and pick up a few things, I just love Daiso!